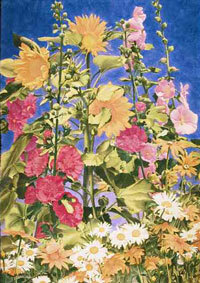 “Country Charmers” began as a watercolor painting, and finished as an acrylic over watercolor painting. 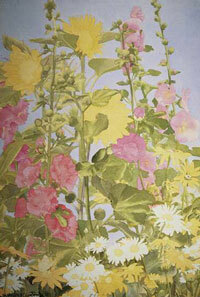 When working with the two mediums, I like to think of the watercolor as an “under-painting”. The work progresses using watercolor until a point is reached where I feel that the addition of acrylic would enhance and intensify the brilliance of the work. At this stage, the watercolor “under-painting” is sprayed with one or two coats of matte medium, and then I proceed to paint using acrylic pigment. Come tiptoe through the garden with me . . .it is my hope that you will enjoy the experience. The paper remains flat and unstretched while I paint. The paper that I use the most often is Arches 300lb rough. over all areas that are to be yellow, green or orange. Red is the next and blue is washed over the background. object is to remain white. 2. The yellows are deepened. The green mix for the leaves is new gamboge, viridian and cerulean. 3. 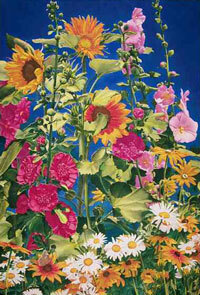 Layers of color are added to the flowers. 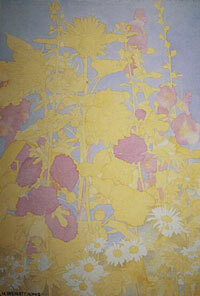 Leaves are deepened with a mix of cadmium yellow, Winsor green and ultramarine blue. 4. 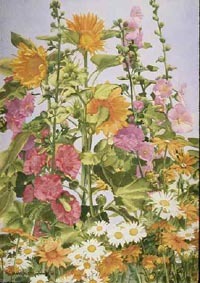 Shadows are painted on the yellow flowers with sap green and quinacridone rose; the white ones with cerulean and cadmium orange; the reds with Antwerp blue; and the pinks with cerulean blue. At this point I spray the painting with one coat of acrylic matte medium to seal the watercolor so I can apply acrylic paint. 5. The reds are intensified with naphtol crimson and quinacridone red; the pinks with permanent rose. Leaves are a mix of cadmium yellow, Winsor green and phthalo blue. A mix of cobalt violet, cerulean blue and ultramarine blue is brushed over the background. 6. To finish the painting, the same palette of colors with the addition of acrylic soft matte medium is applied. The thickness or thinness of the pigment is varied, and glazes are applied over the yellows to increase intensity. 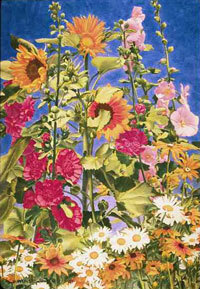 The brown centers of the sunflowers are a mix of cadmium scarlet and Winsor green. 7. To finish the leaves, Jenkins green is added to the darkest areas. Cadmium yellow, cadmium red, and Winsor green for the sunflower centers. The butterfly was gessoed out and repainted. The background was re-inforced with a deeper mix at the top (ultramarine, phthalo and cerulean blues), blended with Winsor green and phthalo blue as the paint was brought down. Some of the leaves in the background were glazed over with this mix to make them blend. 1. The first tint of color is yellow. Yellow will be washed over all areas that are to be yellow, green or orange. Red is the next and blue is washed over the background. My goal at this stage is to cover the entire sheet with a tint of color, leaving only the white paper where the object is to remain white. Click here to see a larger version of the completed painting. When the painting is completed, to me this is the point where I cannot find another spot on the work to place a brushful of paint, The back of the sheet is sprayed with water and is then weighted down and allowed to dry. When dry, the work is sprayed with 3-5 coats of acrylic matte medium. This step serves to “blend” the watercolor and acrylic. It is difficult for the viewer to distinguish between where the watercolor ends and the acrylic process begins. 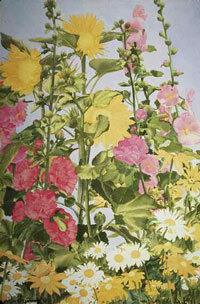 Combined, I find the watercolor/acrylic combination to be the perfect blend for creating vibrant large-scale florals.